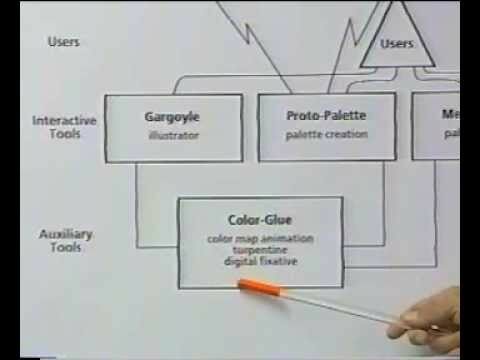 Reading Nathan's remark about seeing bits, reminded me of Bill Cheswick's recent off-the-wall project where he (previously of Internet map posters c. 1998) prints movies, frame by frame, using an HP DesignJet 6100ps plotter. Yes, every frame of the movie is literally printed as part of a contiguous whole—which really makes it more of an on-the-wall project, I suppose. 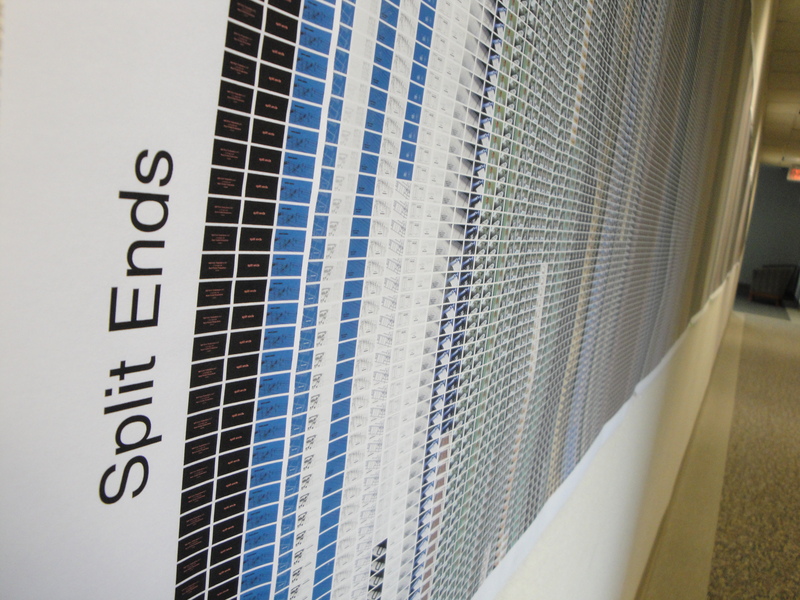 The plotter output shown above is from a 1.36 h animated movie comprising 720 frames per column by 163 columns. Cheswick's original motivation was to hammer the printer but, by considering each of the 117,360 micro-frames to be a color-encoded pixel, it might be possible to detect emergent global structure among the "bits" that is different from the typical story-board structure. However, caution is required because, although all meaning has a pattern, not all patterns have a meaning. 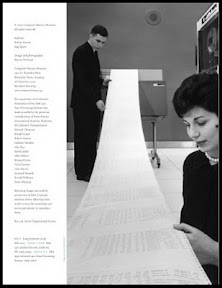 The Computer History Museum has recently published a number of magazines using MagCloud. The magazine on the IBM 1401 has a delightful back cover image. There's just something about tangible bits. The agenda for the upcoming March 15, 2010 meeting of Division 8 of the CIE has been posted to the Division 8 web site (under What's New). In addition, the 2010 annual activity report has been uploaded. 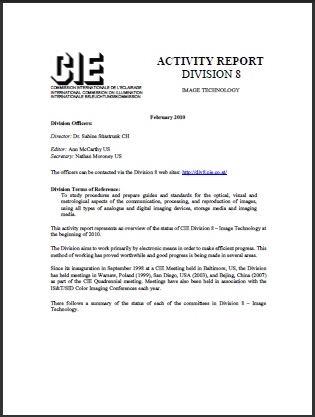 This division of the CIE has the terms of reference: "To study procedures and prepare guides and standards for the optical, visual and metrological aspects of the communication, processing, and reproduction of images, using all types of analogue and digital imaging devices, storage media, and imaging media." So if you will be attending the upcoming CIE meeting in Vienna or have in interest in it's activities these documents may be of interest. 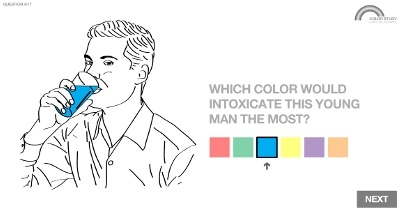 Is green a composite hue, modulated by blue-yellow opponent cells? In the end of 2009, I had the opportunity to re-visit current models of human visual perception investigating color perception as a function of spatial frequency. Based on my engineering background, a simple sinusoidal sweep pattern modulated by different opponent colors appeared to be appropriate to examine some interesting observations. Figure 1. 4 sinusoidal sweep patterns showing spatial bandwidth of cone bipolar cells; (leftmost) black-white demonstrating highest bandwidth without hue changes (achromatic), (center left) blue-yellow demonstrating lowest bandwidth with hue shift toward black-white, (rightmost) red-cyan demonstrating medium bandwidth with hue shift toward black-white, and (center right) magenta-green demonstrating bandwidth similar to blue-yellow with hue shift toward red-cyan. A while back I came across Seyno Sluterman's short article "The NTSC Color Triangle is Obsolete, But No One Seems to Know". It's an interesting and short read but it also makes a call to use the 1976 Yu'v' Uniform Chromaticity Scales instead of the typical CIE 1931 chromaticity values when plotting display gamuts. 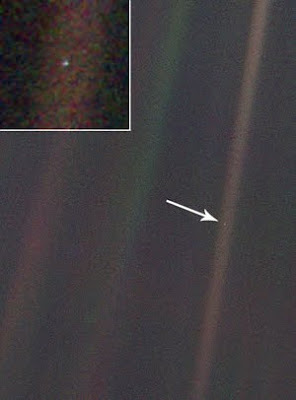 Which is a great reminder (1). 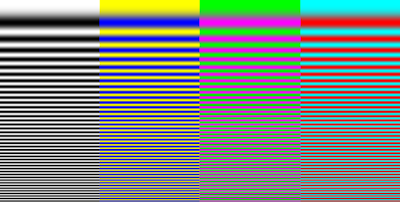 Plotting display gamuts using CIE 1931 chromaticity values appears to be pervasive but it is obsolete. A sun dog is a prismatic effect formed when sunlight is refracted through plate-shaped ice crystals. 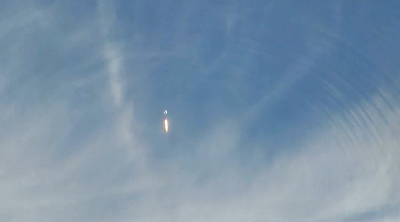 On February 11, the Atlas V rocket carrying NASA's Solar Dynamics Observatory flew past a sun dog during its launch. 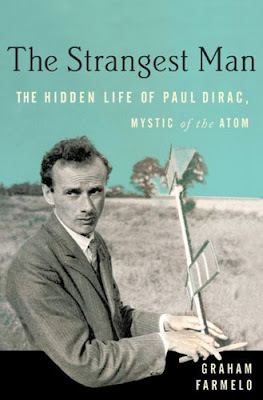 The shock waves produced by the first-stage rocket motor completely obliterated the sun dog. The shock waves are clearly visible in this amateur video @ 1:53. The sun dog is the colored patch in the cirrus clouds located to the right of center. This video also states "the key to image recognition is parallel processing." (49 seconds) Of course high speed image recognition makes me think of a robotic system with the uncanny capability of following a gray sphere (see next video). Pantone LLC announced PANTONE® 15-5519 Turquoise, an inviting, luminous hue, as the color of the year for 2010. Combining the serene qualities of blue and the invigorating aspects of green, Turquoise evokes thoughts of soothing, tropical waters and a languorous, effective escape from the everyday troubles of the world, while at the same time restoring our sense of wellbeing. What’s the hot new color for 2010? According to Color Marketing Group, the leading international organization of color design professionals, it’s grape. In a press release, Color Marketing Group officially designated grape as 2010's color. CMG, which has been successfully predicting color trends for 47 years, says this grape — called Mardi Grape — is a sophisticated crossover between purple, brown and gray. It’s a transfer from fashion with European roots. Chosen by hundreds of color professionals as CMG’s 2010 Next Color, Mardi Grape used to be a fashion color. Now, it’s all set to be the year’s biggest star for everything else. Said CMG president James Martin: "Purple has been with us for a while now, but the big story today is that we’re seeing purple as a neutral for the very first time. This purple is browner and grayer, a neutral we can love long-term. 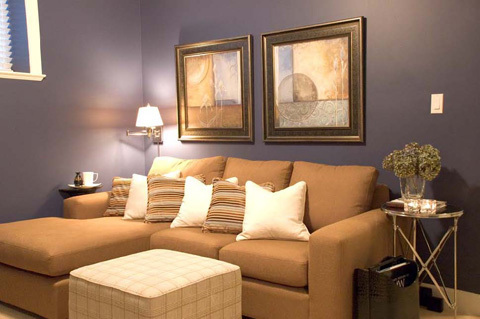 These days everyone is seeking versatile colors with staying power. Colors used to be the focus while neutrals were the understudies. Today, neutrals are the lead performers, chameleon colors that shift and change." Paul, I wonder how this grape relates to eggplant. The National Science Board (NSB, the governing board of the National Science Foundation and policy advisors to the President and Congress) has released the 2010 Science and Engineering Indicators (SEI) report. 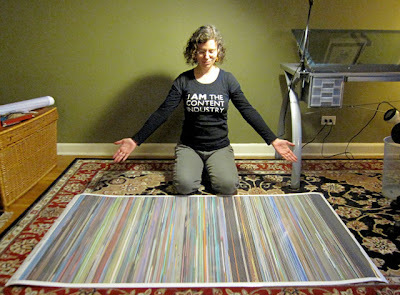 Prints one square meter a second. ... and mixed media print jobs. In the Color Imaging conference, Shoji Tominaga presented the result of his recent Investigation and Analysis of Color Terms in Modern Japanese. Tominaga has worked on color naming for a long time. 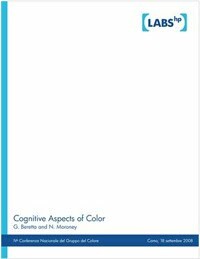 In this most recent study, he used the linguistic method of asking the respondents to compile lists of color names, i.e., no color samples are presented. The lists are then analyzed statistically. The study is double, in the sense that the respondents where asked to compile two different lists: the first with basic color terms and the second with essential (called "absolute" in the paper) color terms. Note that the 11 universal color term are followed by two metallic colors, silver and gold. 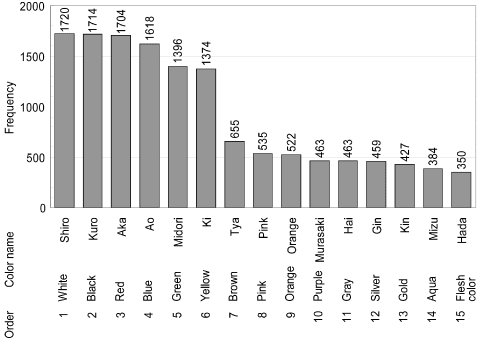 Tominaga notes that this shows the advantage of the linguist's approach of harvesting names without showing samples, because for example the Munsell color tree does not include metallic colors, hence silver and gold would not have been elicited and would have been missed. Note further colors terms 14 and 15. 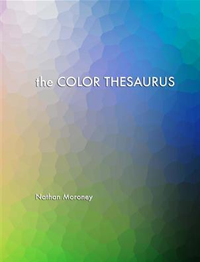 These terms would correspond to turquoise and chartreuse, which, as we commented in our own paper, have been proposed as being basic color terms in the far eastern languages. Translating 水色 [みずいろ] with turquoise instead of aqua as in the paper and 黄緑 [きみどり] with chartreuse instead of yellow green is not completely justified, because by not anchoring the names to an actual color sample, we do not really know what the correct translation is. This is a point in our favor. Correct me if I am wrong, but note also that 黄緑 [きみどり] is not monolexemic, as the use of two kanji indicates, instead of the use of a radical (艾 ?). The second figure shows the frequencies of the essential color terms. Note how changing the question completely changes the distribution. There is a big frequency drop after Hering's opponent colors. 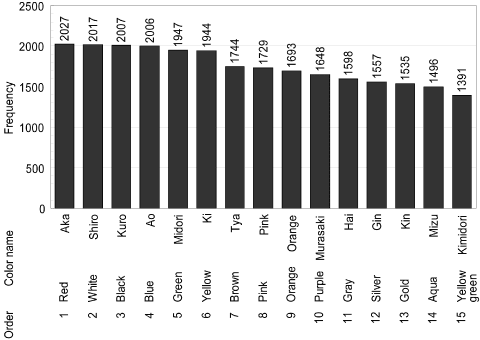 The data in the two figures have been cleaned up for synonyms, which is very important in Japanese, as for example 赤 、赤い、赤色、あか、あかい、あかいろ、レッド、red, all eight refer to the same color red. However, these synonyms are trivial. An interesting result of Tominaga's paper is how they find all synonyms, based on the frequency of color terms in the list. Take for example gray. If you look the term up in a dictionary, you will find three translations, namely 灰色 [はいいろ] (ash color), 鼠 [ねずみ] (mouse), and グレー (gray). Are these synonyms? The lists are parsed to find entries that contain a pair of terms in a single entry. This counts as an intersection of the two terms and is tallied. For example, ash and gray appear 31 times as a pair. Then the single occurrences of each term is counted. The non-obvious part of the algorithm is that when the number of pairs is smaller than both occurrences of the single term, then the two terms are synonyms, otherwise they are not. Therefore, gray and ash are synonyms, gray and mouse are synonyms, but ash and mouse are not synonyms. By the way, ash is a light and mouse is a dark gray. I did not understand why the tally for ash is different when compared to gray (1167) from when compared to mouse (1122). In their table with the details, the numbers are 1198, respectively 1598 for the same case. The other two EI papers on this topic I attended were in the session on Art, Aesthetics, and Perception in the Human Vision conference. Stephen Palmer presented the paper Preferences for individual colors: WAVEs of color, culture, music, and emotion and Karen Schloss presented Aesthetics of color combinations. 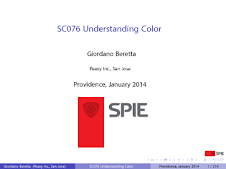 These papers are not yet available from the SPIE Digital Library. I was not impressed by neither these papers, as the experiments were conducted with small numbers of respondents and the experimenters constrained the observations. I therefore think of the results more as opinions of the experimenters than as objective observations that can be generalized. Anyway, Palmer was asked explicitly why metallic colors like silver and gold were not elicited. Palmer's answer was that specular reflections are not relevant, so silver and gray are synonyms, as are yellow and gold. After that, I do not have much to add. After we gave our paper in the session on the Dark Side of Color, I sat down with Tominaga to discuss where to go from here. Essentially we agreed that he has a point against the Munsell Sheets of Color because they have no metallic samples, and I had a point for it because anchoring the color terms to colorimetric data allows operations like translations between different cultures, sub-cultures, and time epochs. While we consider metallic colors, we should also be able to do both matte and glossy samples, because a matte color will reflect the illuminant diffusely and de-saturate the color by adding the white illuminant. Tominaga noted that today, any experiment would be done on a computer display, so the color atlas should be a piece of software, not a physical atlas. Yet, it would have to be more than just a database of colorimetric values. Fortunately, Tominaga has conducted extensive research on BRDF, bidirectional reflectance distribution function, for correctly rendering surface reflectance for any material. 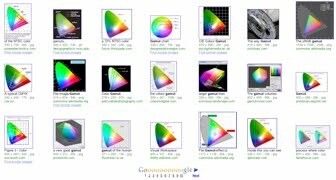 The proposal is then for Tominaga to have a Ph.D. student implement an application that can be embedded on a Web page to correctly render colored surfaces and collect color terms. This software can then be used for a more rigorous implementation of Nathan's and Dimitris' online color naming experiments. The more difficult problem will be how to get around the artificial limitations of sRGB and take full advantage of current display technologies as well as those of the future. The key method for achieving top performance is feedback. At work we usually are given a set of objectives at the beginning of the year and a year later are graded based on how well we reached the objectives. During the rest of the year we just slave away in our cubicles, and nothing has any real consequences. We are planning to start a new conference on Parallel Processing for Imaging. If you have any ideas, suggestions, or want to contribute on the program committee, please shoot me an email. When I arrived in the Silicon Valley, it was the center of the universe for anything connected to silicon. Engineers, scientists, and researchers at the many think tanks were outbraining the Russians and inventing so many new technologies that still today young entrepreneurs are trolling expired patents and old papers to create new products. Some think tanks like Fairchild, SRI, and Xerox PARC generated cascading start-ups, because invention was much faster than business creation. Parts of the Valley, like Sunnyvale, were mostly orchards. For example, when Dave Packard had a new crop on his orchard on Page Mill Road, his secretary Margaret would put a brown bag full of fruit for sale at the coffee station where engineers picked up the free doughnuts every morning. Successful entrepreneurs had expansive houses in Atherton, Woodside, or Los Altos Hills. Palo Alto was a quaint city with a Woolworth on University Avenue and mostly inhabitated by technologists and executives at high tech companies. Houses were typically 1500 to 2000 square foot Eichlers or squarish ranch houses, with a little Accord in the driveway, and costing almost a decade's worth of salary. Today the technologists are largely gone, replaced by investment bankers and lawyers. 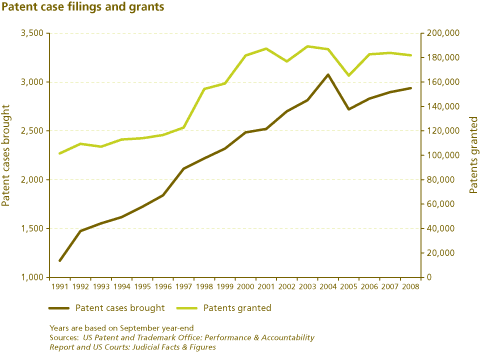 Technology is more lucrative as the object of patent litigation, often by nonpracticing entities, as elucidated in a recent PriceWaterhouseCoopers study. Fortunately for executives, land in Palo Alto has become much more affordable, just a few months worth of their compensation. Therefore, contemporary needs of entertainment space for wine cellars, movie theaters, media rooms, gyms, nanny suites, etc. can be met by building 4 story houses (two underground and two above ground), because the house to parcel ratio requirement can easily be met by buying two or more adjacent lots and consolidating them. Now that the technologists are gone, what is happening to Photonics West, one of the largest conferences in the Silicon Valley with over 15,000 attendees? Well, EI has been priced out of the Valley and will be held at the Hyatt Regency San Francisco Airport Hotel next year. Photonics West already was in San Francisco this year. As EI came to a close, we were wondering what impact it would make to the local hotels, with this January event leaving San Jose after 20 years. I was walking with Mary and John McCann towards the Fairmont Hotel, where we were to discuss with Alessandro Rizzi what we learned from the Dark Side of Color session. We figured this former noisy Photonics West headquarters must be very quiet now. Wrong we were! The place was full of furry animals. Eventually, there is no impact to the local economy for us techies leaving. Photonics West has been replaced by FurCon as the annual conference in the third week of January. 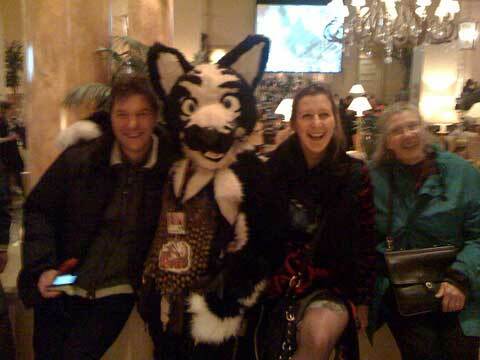 In the picture above: Alessandro Rizzi, Carinna Parraman and Mary McCann with a Furry in the Fairmont lobby. For the report on the local news, click here. Food for thought. Assuming full coverage of the largest 42 pL drops, that one billion drops would be about 2.52 L of ink per minute. "Color management depends on printing process control. Printing process control begins with color measurement. This beginner-level webinar will define a number of important concepts (e.g., calibration, calibration reference materials, tristimulus integration, colorimetric parameters (L*, a*, b*, C*, h, ∆H, ∆E), accuracy, precision, reproducibility, and inter-instrument agreement), and elaborate on these concepts with process control examples in the graphic arts. Participants will become more aware and knowledgeable when using spectrocolorimeters for press/proofer profiling and printing process control." More details about this (and other upcoming webinars), including a link to the registration page is here.